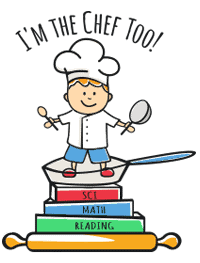 Review: I'm The Chef Too! 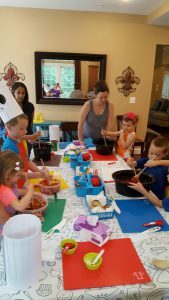 Cooking Class - I'm The Chef Too! My daughter is 2 and my son is 6. They were both able to work separately as well as together to create our dinner! 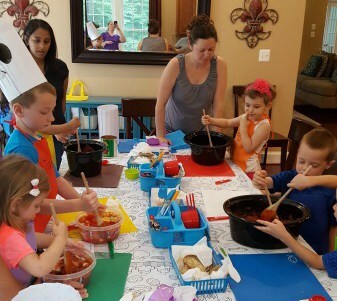 I love that there is a class to teach cooking skills at such a young age! 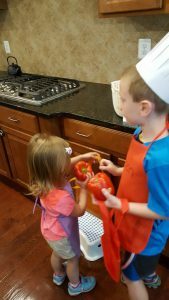 My little ones always want to help in the kitchen and sometimes we as parents don’t realize how much they truly can help prepare meals. Lisa’s class does just that! The kids are the ones doing the hands-on prep work while we as parents assist when necessary, but it teaches the parents too! I never realized that it would be ok to let them take charge of so many things. When we arrived, Lisa greeted us all with a smile and welcomed us to the class. 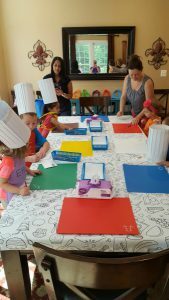 The table was set with aprons and chef hats for each of the children. They loved getting dressed up to play the part of the chef for the morning. She also had a very neat tablecloth that the kids could color on while they waited for the class to begin. Lisa has a teaching background and it truly showed with every detail being thought out for the class. 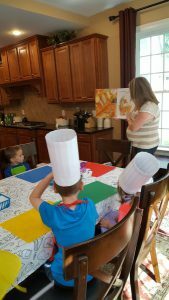 She talked about all of the tools they would be using to cook, had the children wash their hands, and then read a story about vegetables and where they come from teaching them about the food they were about to cook with. While she read the story she asked questions that were right on the kids’ level and really got them to think and learn. That was truly an awesome surprise! I love when you can put education into anything and make it fun. Lisa really did that throughout the entire class. Before they began preparing their dish, the children went “shopping” for the ingredients. Lisa then walked us step by step through the prep of making Chicken Cacciatore. I have never made this before and my 2 and 6 year olds now have. How awesome is that? We prepped everything for the dish so that all we needed to do at home was put it in the crockpot and let it cook. I brought containers to prep our food in, but others used their crockpot. In the future, prepping in the crockpot makes more sense. So that’s my tip for all of you when you sign up for the Chicken Cacciatore class. She offers multiple classes to choose from. My children LOVED this class and are anxiously awaiting to attend another one. I’m so happy that they gained a confidence from this class and were really taking ownership of the dish. They both wanted to help get it set up in the crockpot and chose the rice we had with it. They also reminded us multiple times that they made dinner and we needed to thank them for dinner. It was very cute! View the Original Article – Click Here!